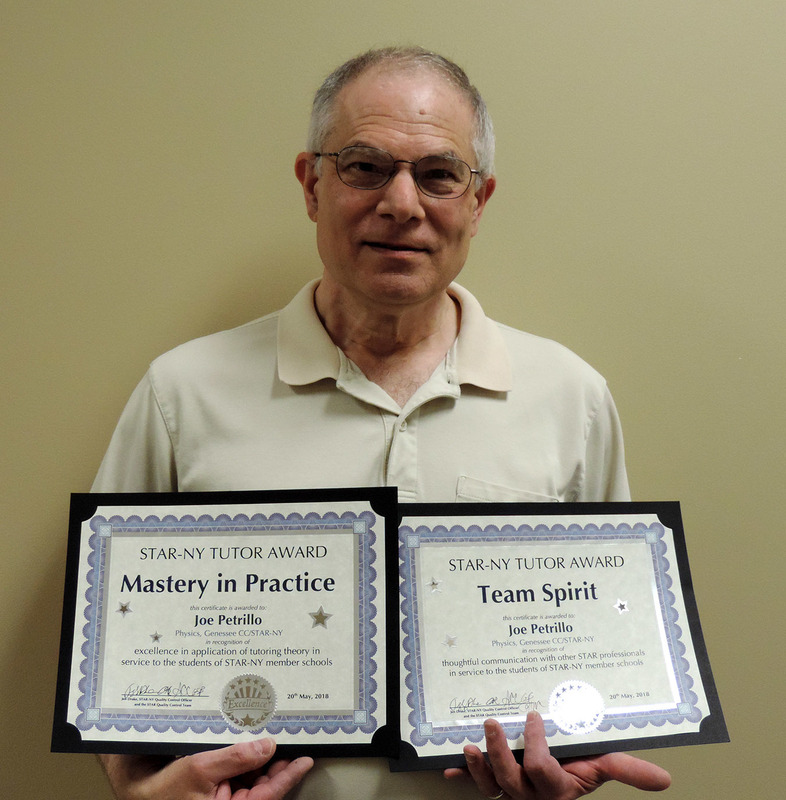 BATAVIA, N.Y. -- On May 21, 2018 Genesee Community College Adjunct Mathematics Instructor and Professional Tutor Joseph Petrillo of Warsaw was awarded a STAR-NY Mastery of Practice and the STAR-NY Team Spirit award for his academic efforts during the Spring 2018 semester. STAR-NY, which is an acronym for Shared Technology And Resources, is a consortium of SUNY colleges and universities who employ instructors and tutors to provide free online one-on-one tutoring for students through the use of the WorldWideWhiteboard. The program's goal is to teach the student how to learn, not what to learn. Students can upload documents into the whiteboard which allows both the student and the tutor to write on them and they both use a chat box in the virtual room for questions and responses. Quality control teams monitor and check sessions to improve the service and document various student needs. The program's subjects and functions are governed by supervisors from each member college and university. STAR-NY's Mastery in Practice is awarded each semester by a five-person quality review panel to a tutor who consistently demonstrates both a deep understanding of the STAR-NY tutoring philosophy, and considerable skill in applying that philosophy in a variety of challenging situations. The Team Spirit award recognizes a tutor who is alert and conscious of unusual occurrences during tutoring sessions for both colleagues and students and reports that information in a timely fashion. Examples of such occurrences could include opening a dialogue with other subject tutors about a shared tutee (even if not on the same night); notifying the quality control officer immediately upon noticing that no room was open for another subject at a scheduled time or following up with a tutee to provide further resources after a session was completed. These types of actions support an effective learning environment. "Joe's performance has been exemplary during his time as a STAR-NY tutor. The skills and techniques he uses have proven to further student learning through very difficult course content," Dr. Craig Lamb, GCC's dean of Distributed Learning said. "It is for these and many other reasons STAR-NY recognized Joe's talents with these awards and will soon welcome him to their quality control team." These recognitions have earned Petrillo a place in GCC's new Recognition Matters series which highlights the accomplishments of the College's faculty, staff and students. Officials at GCC have embraced this series as a way to acknowledge not only the achievement, but the continued high quality of individuals who demonstrate GCC's "beyond expectations" brand each day. 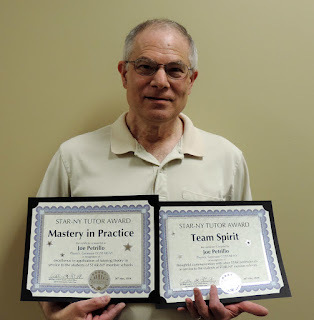 Petrillo, who has been a professional physics tutor through STAR-NY since February 2017, also has experience tutoring in basic college math and algebra, statistics, calculus, biology and chemistry. In addition to the hours he spends tutoring, Petrillo has served as an adjunct mathematics instructor at GCC's Arcade, Warsaw and Batavia campus locations and a test proctor at GCC in Warsaw. In the Spring of 2012, Petrillo was named GCC's Warsaw Instructor of the Semester. He earned a B.S. in Nuclear Medicine from the Rochester Institute of Technology in 1994, his B.S. in Liberal Arts and Science from SUNY Empire State College in 1981 and his A.S. in Engineering Science from Monroe Community College in 1977. He currently resides in Warsaw. Any student interested in using the STAR-NY tutoring services is encouraged to visit http://www.starny.org/ to see the "Available Subjects and Times" and from there, click on "Request a Tutor". Students can also contact onlinetutoring@cortland.edu for more information.